ALBANY, NY (04/27/2010)(readMedia)-- As striped bass are beginning their run up the Hudson River, State Department of Environmental Conservation (DEC) Commissioner Pete Grannis today reminded New York anglers that their recreational marine fishing license initiated in October 2009 is required when fishing for this sport fish and other migratory fish of the sea. Anglers are also reminded that in an effort to restore dwindling stocks, the recreational and commercial fisheries for American Shad have been closed. A recreational marine fishing license is required for anglers (16 years of age and older) when fishing in the waters and along the shores of the marine and coastal district and when fishing for "migratory fish of the sea" species in the waters and along the shores of the Hudson River, Delaware River, or Mohawk River and their tributaries (exemptions can be found on the DEC website at http://www.dec.ny.gov/permits/54950.html ). If you are fishing downstream from the Tappan Zee Bridge, you are considered fishing in the marine and coastal district and will need to have a recreational marine fishing license – regardless of species of fish you are fishing for. If you are fishing upstream from the Tappan Zee Bridge and are fishing for non-migratory fish (such as largemouth bass, smallmouth bass, catfish, carp, walleye, and perch) only, you need to have a freshwater fishing license. If you are fishing upstream from the Tappan Zee Bridge and are fishing for "migratory fish from the sea" (such as striped bass, hickory shad, blueback herring, or alewife) only, you need to have a recreational marine fishing license. If you are fishing upstream from the Tappan Zee Bridge and are fishing for migratory fish from the sea and non-migratory fish, you need both a recreational marine fishing license and a freshwater fishing license. Annual, 7-day, 1-day and lifetime recreational marine fishing licenses and freshwater fishing licenses are available through license issuing agents across the state and via internet sale. To find the nearest license issuing agent or make a purchase online visit (http://www.dec.ny.gov/permits/6101.html). Anglers should also be aware that the possession of a lifetime fishing license or lifetime sportsman license does not provide these license holders the legal privilege to fish for migratory fish of the sea or to fish in the marine and coastal district. Lifetime recreational marine fishing license - covers resident anglers fishing in the marine and coastal district and for "migratory fish of the sea" species only. Lifetime combination freshwater and recreational marine fishing license - covers resident anglers fishing for all fish (marine, "migratory fish of the sea" and freshwater) species. A Recreational Marine Fishing Regulations Guide is also available to view online by clicking on the following link http://www.dec.ny.gov/docs/fish_marine_pdf/marinelic09.pdf . You may print this document, but before sending to the printer make sure to set the appropriate printer settings: Go to File and select Print…, under Page Handling select "Booklet Printing" in the drop down menu next to Page Scaling and select OK.
A Freshwater Fishing Regulations Guides is also available online and can be viewed by visiting the following link http://www.dec.ny.gov/docs/fish_marine_pdf/fishguide09.pdf. Please note that the information on which license is needed to fish the Hudson River (found on page 12) is incorrect. The correct information is presented above. 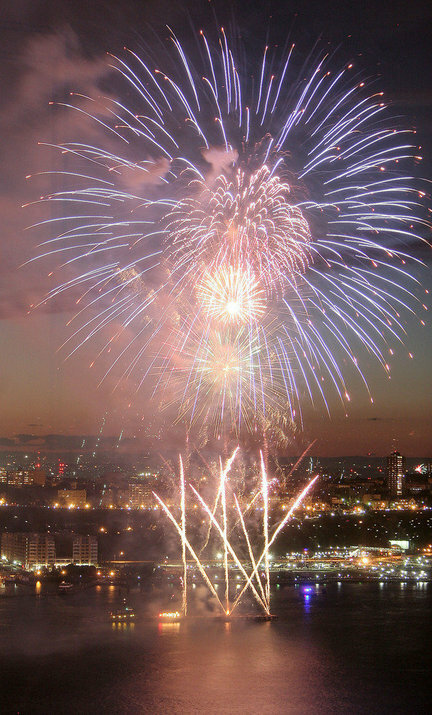 Journal file photoThe Macy's July 4 fireworks is returning to the Hudson for the second year in a row.Once again, the Hudson County's coastline, from Jersey City to Weehawken, will provide the best locations to take in this year's Macy's 4th of July Fireworks. For the second year in a row the Macy's 4th of July Fireworks is returning to the Hudson River, snubbing its longtime staging ground over the East River. This year's show, the 34th for Macy's, will unfold 9 p.m. on Sunday, July 4.
spectacular will celebrate the nation's unique musical voice, ranging from barbershop quartets to gospel, according to a Macy's release. River. The display will fire approximately 1,500 shells per minute reaching heights of more than 1,000 feet, giving millions of spectators magnificent views. Check out our website for a sneak peak of what's on the truck! Save up to 30% on Kayaks, Canoes and 10% on all accessories! Thule Car Rack Sale April 19-25. 15% off all Thule Accessories. Bike Racks, Boxes, Boat Carriers and more! Located along rivers, at the edges of lakes, on mountain boulders, in rock shelters, on rock ledges where the continent meets the ocean, and tucked into parks and public places, American Indian rock art offers tantalizing glimpses of the signs and symbols of Native American culture. Petroglyphs carved into rock surfaces and pictographs painted on them are harder to find in northeastern North America than in the American Southwest, but they are here. The lower Hudson River Valley contains examples of these elusive artifacts from the past. Archaeologist Edward J. Lenik, familiar to many for his work in historic archaeology at Fort Montgomery, has had a lifelong fascination with the petroglyphs and the pictographs of northeastern North America. He has researched and searched out the rock art that remains here and is the author of two books on American Indian rock art of the northeast. He will share his adventures, discoveries, and interpretations on rock art sites in the Hudson region during this evening slide presentation. Book sale and signing to follow event. The National Purple Heart Hall of Honor commemorates the extraordinary sacrifices of America's servicemen and servicewomen who were killed or wounded in combat. The mission of the Hall of Honor is to collect and preserve the stories of Purple Heart recipients from all branches of service and across generations to ensure that all recipients are represented. The National Purple Heart Hall of Honor is part of the Palisades Interstate Park Commission which administers 28 parks, parkways, and historic sites for the Office of Parks, Recreation and Historic Preservation in New York as well as the Palisades Interstate Park and parkway in New Jersey. Memorial Weekend is a time to reflect upon, and commemorate all those who died in service to this country. It is also the anniversary of a ceremony in 1932 where veterans of World War One were formally given the Purple Heart. Friday, May 28, 2010 at 2 PM: 78 years ago on this day, 138 veterans of World War I received their Purple Heart medals on this site. Join us in celebrating this anniversary as a modern soldier is formally awarded his Purple Heart. Memorial Day & Its Historic Roots: Saturday, May 29, 2010, 10 AM-5 PM. Memorial Day began, as a national observance in 1868 as a way to commemorate and honor those who died preserving the Union during the American Civil War. The day will have a concert by the New York Guard Band, host a Civil War living history program and a short presentation on the origins of the holiday and a profile of some of the 1932 Purple Heart recipients who were wounded during the Civil War. The site is located at 374 Temple Hill Road (Route 300) in the town of New Windsor, three miles south of I-84 exit 7B and I-87 exit 17. Parking, gift shop, and picnic grounds are located on site. Museum exhibits are open 10:00 AM to 5:00 PM Monday - Saturday and from 1:00 PM to 5:00 PM on Sunday. For more information, please call (845) 561-1765. 1PM- 4 PM at Anthony's Pier 9 in New Windsor. Tribute organized by the Purple Heart Hall of Honor, Inc. Board of Directors. This event will honor and recognize Purple Heart recipients and veterans who have served and those men and women who are actively serving our country at home and around the world. General David Petraeus will serve as keynote speaker. To reserve your ticket and learn more about the event, please visit: PURPLE HEART HALL OF HONOR or call: 845.733.5384. Saturday, August 7, 2010: 11 AM- 3 PM . Military Timeline, 17th-20th centuries; Veteran's Outreach program, History of the Purple Heart; Firing demonstrations. Details to follow. Thursday, November 11, 2010: 11 AM- 1 PM and 2PM-4 PM . We are reminded each year on November 11th to commemorate and give thanks to all who have served our country from the Revolutionary War to the current Global War on Terrorism. Veterans will share their recollections of their service. There will be musical selections in honor of our veterans, and light refreshments will be served. 2003-2010 The Palisades Parks Conservancy. We're dancin'... and we're gettin' down and outrageous with suburban life – that's something you can't miss! Click here to listen to an article featured on NPR. And click here to buy tickets! Staged to Ravel'sBolero, this work, commissioned for our community by The PAC, has been created by NYC choreographer Larry Keigwin along with Keigwin + Company. That same evening Keigwin + Company will perform 3 of their own choreographed works; Mr. Keigwin's lofty "Air;" the delightful "Love Songs," and "Tryptich." The finale is of course, Bolero Suburbia! A nightclub experience unlike any other... come see this dynamic duo perform a heady mixture of lounge act, jazz concert and theatre. Hurry... there are only a few tickets left! Click here to read a NY Times article about Pizzarelli & Molaskey . **Due to the conflict with the fire system on November 17 during the screening of Red Cliff, an extra date has been added to Talk Cinema. Further details will follow in our next e-blast. Composed in 1791, Mozart's magical tale is filled with adventures, romance, and colorful characters. Tamino, armed with a magic flute and accompanied by the rollicking avian jester Papageno, and three spirits to guide them, sets on a quest to save his love - the fair Pamina. They overcome many obstacles and defeat the Queen of the Night. This new production directed by Jacque Trussel includes the Purchase Symphony Orchestra conducted by Hugh Murphy with set and costume designs by members of the Purchase Design and Technology program. "The opera will be presented in German with English subtitles including the charming English dialogue of W.H. Auden," said Trussel. "It will be a magical evening for everyone." Enjoy classics by George Balanchine ("Serenade"), Paul Taylor ("Company B"), two premieres of original works created for the Purchase Dance Corps by Luca Veggetti and Pam Tanowitz, plus excerpts from "Gelem, gelem" by Nelly van Bommel. Artistic Directors for this concert are faculty members Bettijane Sills and Megan Williams. The Purchase Dance Corps, the performing company of the Conservatory of Dance at Purchase College, presents a diversity of work ranging from reconstructions to contemporary modern and classical ballet repertory to new works created especially for the Purchase Dance Corps. New! Get Protectyourwaters.net updates via RSS. Pennsylvania Boat & Fish Commission Doing Its Part to Stop Aquatic Hitchhikers! Celebrate Earth Day and springtime with some family and earth-friendly fun at Trailside Museums and Zoo on Saturday, April 24, 2010 from 10:30 AM to 3:00 PM. There will be nature-related displays, activities and games, plus some tips to help you look after Mother Earth! Trailside Docents will be here to help you learn about our animals and other exhibits. Come early, at 10:30, and you can help us make treats for the Bears, and they will come out of their dens to gobble them up at 11:00. In our Amphitheater, hear live music by the "State Workers" at 1:00 p.m. and nature presentations and stories throughout the day. Please call (845) 786-2701 x293 or e-mailCHRIS.OSULLIVAN@OPRHP.STATE.NY.US for more information. There is not a separate admission fee for the zoo. Donations are welcome. There is a $8.00 parking fee at Bear Mountain State Park. Trailside Museums & Zoo is part of the Palisades Interstate Park Commission. The Palisades Interstate Park Commission administers 28 parks, parkways, and historic sites for the Office of Parks, Recreation and Historic Preservation in New York as well as the Palisades Interstate Park and parkway in New Jersey. For information about New York State parks and historic sites, please visitWWW.NYSPARKS.COM and for more information about the Palisades Interstate Park parks and historic sites, please visitWWW.PALISADESPARKSCONSERVANCY.ORG. 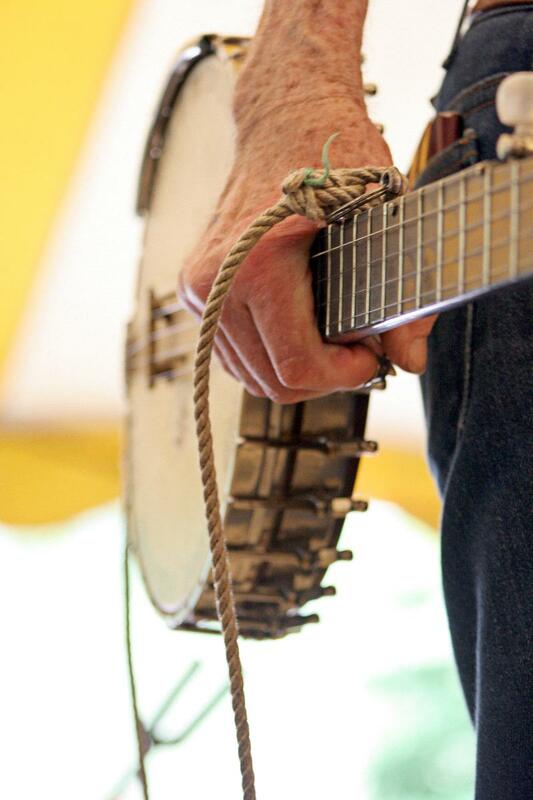 Perform Live as part of The Trailside Summer Music Concert Series! Join us Saturday, April 24th at 1 PM for some original art-rock on environmental themes during Trailside's Earth Day Celebration. . The State Workers is a collaborative musical group who blend sustainability, a "Do-it-Yourself" spirit, and the "Cosmic Yes" into everything they do. The result is a fusion of jazz, rock, folk, country, blues, and world music that has been heard in New York City, Jersey City, and throughout small towns across the Highlands. Their music was featured at the grand opening of the Trailside Museums and Zoo Amphitheater where they were joined by the audience in acoustic renditions of their original environment focused compositions. There is not a separate admission fee for the zoo. Donations are welcome. There is a $8.00 parking fee at Bear Mountain State Park. The American Cancer Society Bark For LifeTM at Bear Mountain, formerly known as Dogswalk Against Cancer at Bear Mountain, is a noncompetitive walk event for dogs and their owners to raise funds and awareness for the American Cancer Society's fight against cancer. There are no maximum or minimum amounts to raise - those with pledges of $500.00 or more will receive the Golden Bone Award and those with pledges of $1,000.00 or more will receive the Wonder Dog Award. Cancer sneaks up like a thief in the night. It's elusive, unexpected and unwelcome. Here's your chance to "bite back" and help to find a cure for cancer. By supporting Bark For Life, you help the American Cancer Society save lives, and that helps us move closer to our ultimate goal of a world with less cancer and more birthdays. So bring your best canine friend and join us for a fun-filled day starting with a walk around Hessian Lake, and continuing with demonstrations, contests, and games. It's a chance to make new friends and share memories.Join us on Sunday, May 2, 2010 from 8:00 AM - 12:00 PM for a fun filled day of events. There's something for everyone to enjoy! EVERY DOG MUST BE ACCOMPANIED BY AT LEAST ONE PERSON! Here's how to sign up: REGISTER ONLINE (DEADLINE IS 4/29/10) , by regular mail or in-person the day of the event. Check-in is from 8:00 AM until 9:30 AM when we begin our walk. Pre-Registration: $20.00 per person* Day of Registration $25.00 per person* Children 16 years and younger are free.Bear Mountain Parking Fee is included in registration fee. After the walk, stay for entertainment, and fun contests! Purchase delicious food and shop the many vendors at the event. Get ready for some high-flying action! Intrepid President Bill White and Space Shuttle supporters pose for a photo in Times Square to show support for bringing a NASA shuttle to the Intrepid Museum on April 15, 2010 in New York City. Intrepid Air, Sea and Space Museum directors pose with local officials at Grand Central station to show support for bringing a NASA shuttle to the Intrepid Museum. It's not as cool as traveling in outer space, but a crew of space buffs dressed as astronauts hopped on the shuttle to Times Square Thursday to tell NASA: "We want a space shuttle!" "I've seen them on TV, they're cool!" saidMichael Coyne, a 7-year-old from Croton-on-Hudson who is trying to decide whether to be an astronaut - or a paleontologist, or a veterinarian - when he grows up. Michael and his dad, Kevin, put on astronaut suits and rode the S train with several other space enthusiasts as part of the Intrepid Sea-Air-Space Museum's effort to land one of the three soon-to-be-retired shuttles. "It's a good fit for New York City," said Kevin Coyne, a network architect and space nut. Ivy Deliz, 25, of Manhattan, is a Columbia University grad student who recently interned at NASA's prestigious Ames Research Center in California. "I love the shuttle. We all do. It's one of the greatest engineering achievements of our time," she said. Intrepid President Bill White said New Yorkis one of the "top choices" among 21 institutions vying for Discovery, Atlantis orEndeavour. Gov. Paterson, Manhattan Borough President Scott Stringer and BrooklynBorough President Marty Markowitzjumped aboard the effort Thursday. "The Intrepid itself is an icon," Paterson said. "Uniting it with the shuttle ... would just be a perfect marriage." NASA is expected to make a decision on where to send the shuttles by July. The final shuttle mission is slated for next February. NASA officials said they're leaning toward giving Discovery to the Smithsonian Air and Space Museum in Washington.